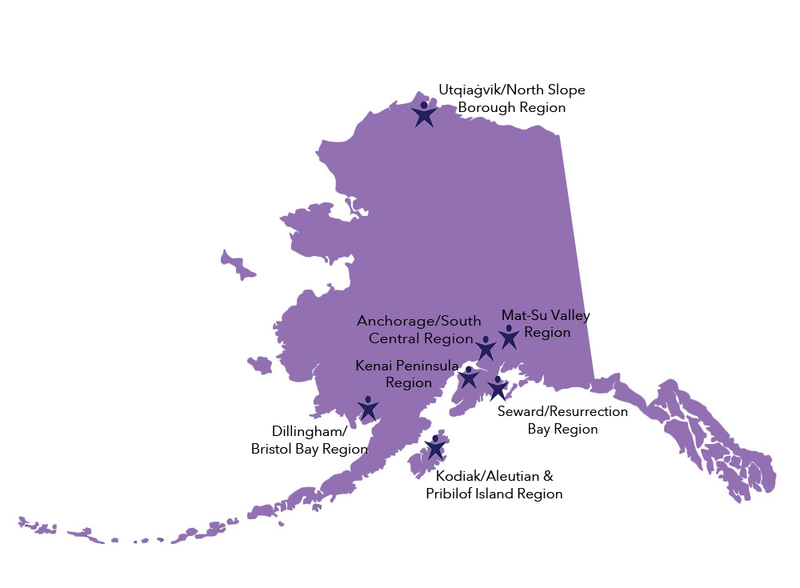 Statewide Services - Hope Community Resources, Inc.
We provide services statewide administered through regional offices that are located in Anchorage, the Mat-Su Valley, Dillingham, Kodiak, Seward, Barrow, and the Kenai Peninsula. We also serve the outlying areas and numerous rural communities surrounding each region. We customize regional service delivery to meet the unique needs and wishes of each community. Below are a few highlights of each region. For additional information, please contact the region’s director. Contact information can be accessed by clicking on the regional hub. This region owns and/or leases over 50 assisted living homes and apartment clusters providing supported living for adults. In addition to adult services, there is a growing focus on family services, including foster care supports. It is also home to our Discovery Center at Hope, which houses Hope Studios and Gallery as well as a recreational facility that offers a variety of activities, classes and camps throughout the year. In additional to offering in-home and respite supports, this region offers an assisted living home for behavioral health. This region operates one assisted living home and supports families and children throughout the region. Services are tailored to support a subsistence lifestyle, teaching hunting, fishing, trapping, gardening, and much more. This region operates an assisted living home and an apartment cluster supporting independent and semi-independent living needs. The majority of their services are centered around independent and family supports. This region is very community-oriented and has a very active outdoor pursuits and recreation program as well as a robust children’s program, Little Bears. This region operates several assisted living homes, provides supports to a number of foster families and supports the Willow Ranch, an intentional community focusing on a rural lifestyle. It is also home to the All Birds Center, which hosts a myriad of recreational and art activities throughout the year. This region operates two assisted living homes and supports several other individuals in their own homes. The program is supported by an active Seward Community Resource Team who advocate and fundraise on behalf of their neighbors who experience disabilities. This region operates a number of assisted living homes for adults and supports foster care providers and families. It is also home to the Hope Kenai Community Center, providing space for recreational activities, classes, and community gatherings.